If you belong to those who use voice assistants, then the phrase “Ok Google, send a Hangouts message”, is finally working correctly. Before that, Google’s assistant used to send standard SMS/MMS messages but not instant Hangouts messages. Now, once you have pronounced the “magic” phrase, a window for typing a message appears. 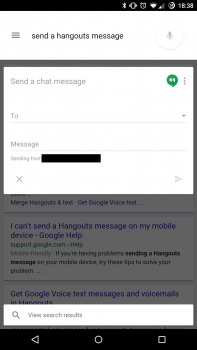 It will go to the top of the page in the app that you are currently using without opening Hangouts itself. For those who are in doubt regarding the expediency of this method, let us recall that on some devices the “Ok Google” phrase works even when the screen is turned off. Therefore, such a method of messaging indeed takes place. Those who use Hangouts as their main messaging app and who are accustomed to talking with the robot from the Corporation of Good should try this new feature.